Dedicated to the 70th anniversary of Universal Declaration of Human Rights (HR), the opening ceremony of the 4th edition of Human Rights through Cinematography Film Festival held at Pakistan National Council of Arts, (PNCA) here Sunday. Federal Minister for Information & Broadcasting Chudhry Fawad Hussain was the chief guest on the occasion while European Union (EU) Ambassador Jean-François Cautain delivered welcome address. 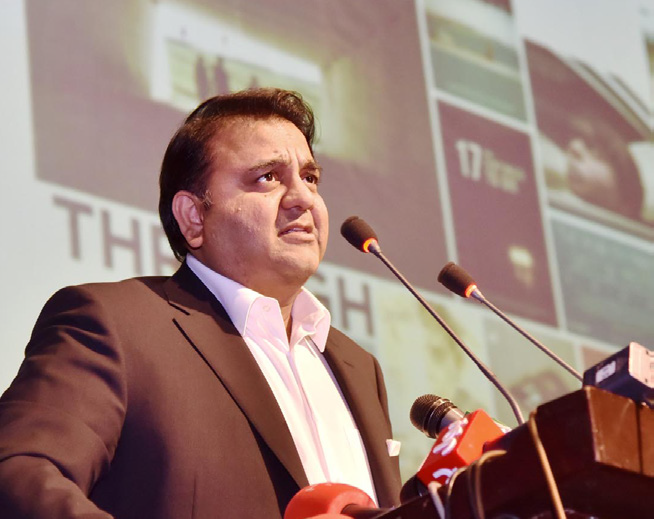 Fawad Chaudhry while commending the EU for screening 15-day festival suggested the EU should also highlight Kashmir and human rights violations in the Indian-Held valley. Pakistan, he said, has taken the first step towards peace by opening the Kartarpura border and now it’s the Indian turn to show a similar positive gesture and reciprocate Pakistan’s peace move. EU Ambassador Jean-François Cautain was of the view arts and culture in general and documentary films in particular, are increasingly playing an important role for understanding the world and its peoples. According to Cautain the Human Rights through Cinematography Festival, especially with the screenings in universities, is an excellent tool to raise awareness about different facets of Human Rights and to engage students in constructive debates. The EU stands firm with Pakistan in its efforts for the promotion of Human Rights with special focus on gender equality, freedom of religion and belief, rule of law, access to justice and freedom of expression. From November 25 to December 10, the film festival is led by European Union (EU) and the United Nations Pakistan in partnership with a large number of member states of the EU, the UN, Pakistan Institute for Parliamentary Services, The Centaurus Cineplex, and educational and cultural institutions. The opening ceremony featured the screening of ‘Freedom for the Wolf,’ an epic investigation into what the filmmaker Rupert Russel terms as ‘illiberal democracies’ and how a new generation of elected leaders is dismantling freedom and democracies as we know it. Afterwards, Member of National Assembly Maleeka Bokhari, academic and journalist Harris Khalique, and human rights activist Marvi Sirmed participated in a panel discussion moderated by Waqas Rafique, Communication Officer at the Food and Agriculture Organization of the United Nations. The festival presents 27 award winning documentaries on human rights issues from around the world, such as freedom of expression, gender equality, access to justice, minority rights and death penalty. The screenings will be held simultaneously in 9 cities of Pakistan, comprising Gujrat, Lahore, Rawalpindi, Multan, Islamabad, Karachi, Peshawar, Charsada and Quetta. Screening venues include universities, embassies, Pakistan Institute for Parliamentary Services, and cultural spaces such as Goethe-Institut, PNCA, Pakistan Chowk Community Centre and Olomopolo Media. This year, for the first time, the festival will also have screenings at the Centaurus Cineplex with an opening on November 29. The screenings are open to the public. The festival aims to provide a window to universal human rights challenges to the Pakistani public in general and the young audiences in particular calling upon them to reflect on solutions. Director General PNCA Jamal Shah on the occasion said the magic of cinema can engage you into interesting dialogue and transport you into many different worlds. Cinema, both narrative and documentary, is probably the most accessible and effective vehicle for promoting social change in the world because it could address topical human rights issues around the world”. Beware, Pollen is in the air!